Racing figures tour a KC-135 Stratotanker aircraft, get dirty with military working dogs, hop inside a state-of-the-art aerial refueling simulator and spend time with military families… all in just one day. Stewart, Larson and Chitwood III kicked off their moment-filled USO tour with a tour of a KC-135 Stratotanker aircraft, followed by a military working dog demonstration and an up-close look at MacDill’s state-of-the-art aerial refueling simulator. Immediately following the unit visits, the trio participated in a USO meet & greet with troops and their families at the Surf’s Edge Club on base. The visit then capped off with an insightful media opportunity, where each tour participant reflected on their visit, shared personal thoughts of this year’s racing season and highlighted their support of America’s Armed Forces. Stewart, Larson and Chitwood III join a growing list of racing figures who have participated in USO entertainment tours since 2011. 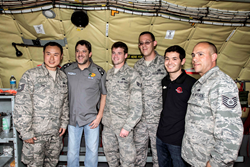 Among other NASCAR stars who have volunteered with the USO are Joey Logano, Brad Keselowski, Ricky Stenhouse Jr. and Daniel Suárez. Together, the group has visited and created #USOmoments for 1,156 troops and military families stationed at seven military bases (and one military hospital) located in Guantanamo Bay, Cuba; Germany; Kuwait; and Luke Air Force Base, Arizona. NASCAR’s commitment to those in uniform runs deep. In addition to providing military ID holders with discount tickets to all of its racing events, NASCAR works regularly with the USO. Whether deploying drivers (like Stewart and Larson) on USO handshake tours, featuring the USO’s logo on its race cars, helping the USO unfurl its 80 foot by 120 foot Every Moment Counts flag, or reuniting military families… NASCAR is always looking for ways to honor and salute today’s military community. Read past USO/NASCAR stories here http://blog.uso.org/tag/nascar/. Born and raised in Columbus, Indiana, Stewart is a three-time NASCAR Sprint Cup Series champion and NASCAR team owner. One of NASCAR’s biggest stars, he owns and drives the No. 14 Bass Pro Shops/Mobil 1 Chevrolet. He is best known for beating veteran racer Mark Martin in 2002, bested Greg Biffle in 2005 and winning the season finale at Homestead-Miami Speedway in 2011 - the first championship driver/owner since 1992. Stewart’s racing career began at age seven, when he took up go-kart racing with help from his father, who served as car owner and crew chief. Kyle Larson grew up in Sacramento, California and was named 2014 NASCAR Sprint Cup Rookie of the Year, driving the No. 42 Target Chevrolet SS for Chip Ganassi Racing with Felix Sabates. Competitively racing since he was seven, he was 2013 NASCAR XFINITY Series Rookie of the Year and 2012 NASCAR K&N Pro Series East Rookie of the Year. Of Japanese-American heritage, Larson is a graduate of NASCAR's Drive for Diversity program, an initiative designed to put more minority drivers in NASCAR's national series. Chitwood III, a native of Tampa, is president of the Daytona International Speedway and oversees all speedway activities including event entertainment, fan amenities and ticket sales. He assumed the role in August 2010 and was previously the Vice President of Business Operations for International Speedway Corporation (ISC) – a motorsports entertainment company based in Daytona Beach. Prior to joining the International Speedway Corporation in August 2009, Chitwood III served as President and Chief Operating Officer of Indianapolis Motor Speedway. He currently sits on the board of trustees for the Motorsports Hall of Fame of America as well as the boards for the Daytona Beach Chamber of Commerce and the Central Florida Partnership.